Our company is engaged in manufacturing of a wide range of Bonded seal, which is a static bonding material used in between the nuts and bots of the hydraulic and Earth Moving Machinery. Our range is highly acclaimed in the market owing to features such as high tensile strength, dimensional accuracy, high frictional resistance and long service life. We are a proficient name in the industry involved in offering an optimum quality of Bonded Seal. In order to provide utmost satisfaction to our clients, we engage in the utilization of high grade raw materials and modern machines, in compliance with the set industry norms and guidelines, for manufacturing this range of Metal Bonded Seals. We are one of the renowned organizations, involved in offering a wide gamut of Metal Bonded Seal to our clients. The basic materials used in the designing of these products are high quality. We offer a large standard range of rubber to Metal Bonded Seals in various sizes. 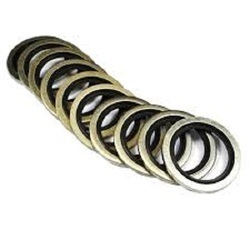 Metal Bonded Seals are made of durable high-grade rubber, our rubber to metal bonded seals are engineered to resist tearing, abrasion, wear and friction, Featuring excellent high temperature and corrosion resistant capabilities, our rubber to metal bonded seals are highly demanded in various industries. With vast experience and knowledge we are involved in offering a wide array of Metal Bonded Seal. We offer these seals in market in both standard as well as customized specifications to meet the various demands of our customers. These are highly reckoned among our clients due to their perfect finish and competitive prices.